NI ROCKS - That was 2016 - Update and Thanks! I decided last year that I wasn’t going to post a “review” of 2015 and for the same reasons I have no plans to do one for 2016. We’re all aware of the talented artists we have lost in the past 12 months and nothing I could write would add to what others have said. And, as I’ve generally very little time for other peoples Top 10 whatever of the year, I’m working on the presumption that no-one really cares how many gigs I went to or what my favourite gigs or albums were! What I would like to do though is express my thanks to many people and look back at the past year for “NI Rocks”. In particular, thanks to anyone who takes the time to listen to a Show, read something on the Rock Radio NI website or interact in any way on social media. The latter is increasingly challenging for those running anything similar to NI Rocks; unless you are willing to buy “likes” or pay to increase access, so I really appreciate those who take the effort to like, comment on or share posts. Both of the NI Rocks Shows on Rock Radio NI have been going for more than six years now, but I’m still very much an amateur. As I often say, I’m just a guy who likes rock music and has the opportunity to play tracks on a radio show – not a DJ, nor a journalist. So thanks to all of you who have actually tuned in (by whatever means), at any time, to listen to any Shows. This year, we uploaded 52 episodes of the NI Rocks A-Z Show and 52 of the Friday NI Rocks Show; featuring 726 different artists on the former and playing around 700 tracks by 284 different artists on the latter. 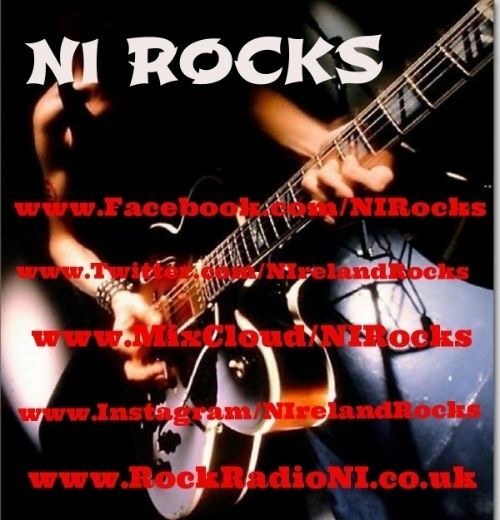 Over the past year I posted 21 interviews on the Rock Radio NI website – that included 18 that were broadcast on the Friday NI Rocks Show or A-Z Show. A big thank-you therefore goes to those that recorded Shows for me and to those that helped organise things. My guests were Pat McManus, Craig Goldy, Mat Sinner, Tequila for Breakfast, Tommy Rockit (Stone Trigger), Michael Del Pizzo (Sunflower Dead), Brian Tatler (Diamond Head), Chloe from Skarlett Riot, Bob Catley (Magnum), Nick & Marcus from Vega, Nathan James from Inglorious, David Balfour from Maverick, Stitched Up Heart, Steve Grimmett (Grim Reaper), Those Damn Crows, Graham Bonnet, Voodoo Vegas and Clifford Hoad from Kings of the Sun. All the interviews are also available to read on the Rock Radio NI website, although sometimes I’m not the quickest at getting them typed up!! What is great to see though is that the number of hits on the Interviews section of the website has more than doubled in the past year. During 2016 I posted 126 album recommendations – the most of any year so far. The number of recommendations is a reflexion of how much great music there is out there. They also serve as a sign of appreciation to the many labels, PR companies and artists that have shared music with us over the last year. My thanks to all those that continue to work with us. I also endeavour to publish some of the news releases and PR e-mails that get shared with us, but must admit that limited time means that not as many as I would like get published on the website. The dedicated NI Rocks social media sites on Facebook (2,325 likes) and Twitter (3,926 followers) continue to expand at a slow but steady rate, though Facebook increasingly frustrates me and the opportunities to do much without having to pay for it are diminishing. Twitter also has its limits, but is probably more effective for sharing information. My Instagram account is part NI Rocks / part personal, but also continues to grow. I’ve continued to work with The Limelight / Shine to run competitions on a regular basis and have also done some for SD Entertainment and MCD Productions. My thanks to them for providing the prizes and to everyone who has entered the competitions over the past year. We’ve had 26 lucky winners this year. Probably the fastest growing NI Rocks site is our YouTube channel where the number of views has increased by more than 50% in the past year; passing the 770,000 mark recently. There are now 855 subscribers to the channel. That was 2016. All the best for 2017! !